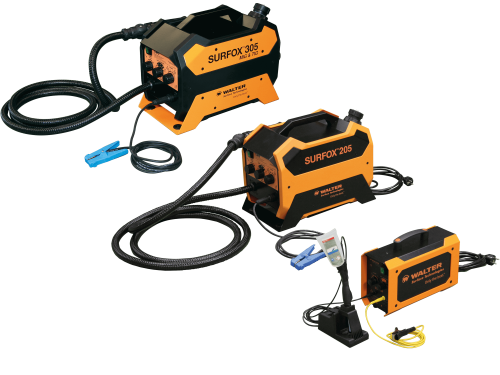 The SURFOX weld seam cleaning system is a highly effective method for the removal of tarnishing after stainless steel welding (TIG, point welding, and pulsed MIG) without altering the base material surface. It also promotes the formation of a uniform, resistant passive chromium oxide layer for protecting the stainless steel from further corrosion. SURFOX is a safe, fast, and cost-efficient alternative to the very hazardous pickling pastes and abrasive weld seam cleaning processes such as brushing and grinding. SAFE - SURFOX cleaning electrolytes are NSF-certified for use in the foodstuffs industry and pose no health risk for the operator. FAST - Cleaning and passivating of a TIG weld seam at a speed of 1 to 2 metres per minute. EASY TO USE - The integrated dosing pump automatically transports the electrolyte liquid from the tank to the wand of the SURFOX device so as to guarantee an uninterrupted cleaning process.